Comrie lies in the valley of Strathearn which is an area of outstanding natural beauty. 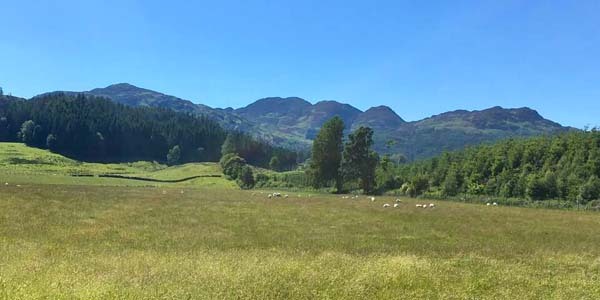 Comrie village is a gateway to the Highlands and also is only a short drive away from Loch Lomond National Park. Within the village there is good selection of shops including post office and bank and eating establishments to suit all palettes. The surrounding area has some of the best countryside Scotland has to offer and locally there are numerous walks for all abilities. For cyclists there are a range of varied biking trails and many opportunities for the keen angler - fishing is available on the local rivers and boat hire can be obtained at Loch Earn which is 3 miles away. Golf courses are in abundance in Perthshire with over 30 courses to choose from, including Comrie which has 9 holes and slightly further a field, the world famous Gleneagles resort. Crieff is 7 miles from Comrie and this old historic drovers' town also is home to the "Famous Grouse" - Scotland's oldest whisky distillery. Perth, a further 20 miles from Crieff, was once the proud and historic capital of Scotland and still maintains many of its period buildings. Scone Palace is where the kings of Scotland were crowned and is open daily along with its beautiful gardens. Perth has an excellent theatre, concert hall and wonderful independent shops. Charming cottages in Comrie enjoy spectacular views over the Perthshire countryside and is a haven of peace and quiet. Choose an idyllic Scottish honeymoon cottage - there is so much you can do in the surrounding area - and then return to a gorgeous cottage for a relaxing evening!